- Andrew and I got a new car! Shortly after Christmas we bought a 2013 Ford Explorer. Its pretty swanky. Its got a whole bunch of bells and whistles - who knew how much I would love a heated steering wheel? Its a bit bigger than my old Escape and we have to fold in the mirrors to fit it in the garage. I'm also still learning how to park with it so if you see a silver explorer terrible parked somewhere in Redmond, its probably me. - I've started a new session of Body Back but this time I'm doing Wednesday and Friday at 5:30. AM. Its freakin' early people. But, when I'm done I come home and get to spend some time with Sawyer and Andrew and while Sawyer naps I get some time to do my bible study or watch something on TV. Its kind of nice. There are 5 of us in this session (much different than it being just me) and its fun to have other gals there to encourage each other. - Speaking of my health, we've been doing the Dukan Diet for a month or so now and its going pretty well! I'm down about 8 pounds and seeing numbers on the scale that I haven't seen in two years! - Sawyer has been sick this weekend and after a visit to the doc this morning he has been diagnosed with his very first ear infection. I'm a little proud that its taken 16 months to get there. So we are armed with amoxicillin and ibuprofen and hoping to see some improvement. 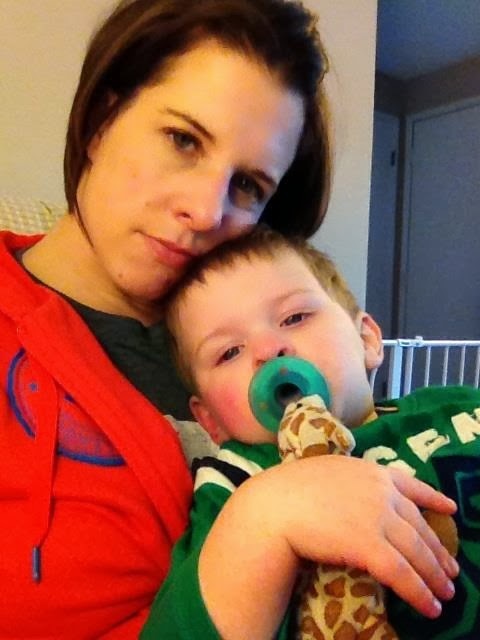 Until then, its lots of snuggle time and watching Elmo videos on YouTube (which mommy doesn't mind).